Ganges river water is revered by Hindus for its holy properties. The water is gathered from Sridhama Mayapur, birthplace of Krishna. Ganges river water is revered by Hindus for its holy properties. The water is gathered from Sridhama Mayapur, birthplace of Krishna. The water has not been treated or filtered. In addition, small amounts of water have been added that are from 1008 sacred holy places in India. The water is in a high quality transparent blue plastic bottle, 100% leak proof, unbreakable, 375 ml. Although the water is considered pure, we do not attest to its safety for drinking. Please boil and add chlorine if you want to drink the holy water. Greetings! I have purchased from your company several times and it's always a very smooth transaction. The orders are processed very quickly and your pricing is very fair. I look forward to more purchases from you in the future. 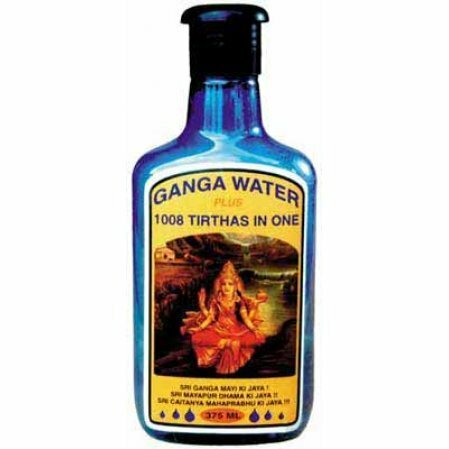 There are various Ganges Water packages available in the market. The unique aspect of this is the fact it is combined with water with 1008 Tirthas/Pilgrimage sites. That along with the trust of buying it from Vedanta Catalog helps a lot.